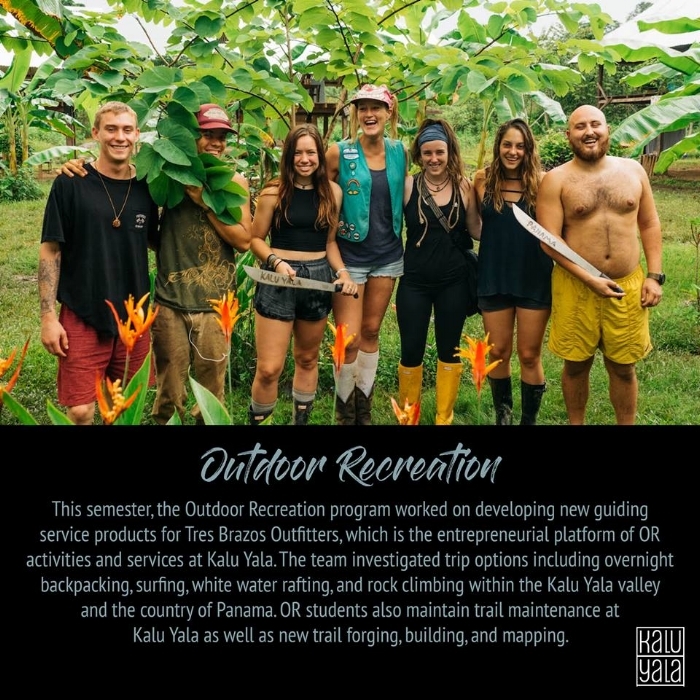 In Fall of 2017, three Outdoor Recreation students at the Kalu Yala Institute chose to bring Kalu Yala into the social-hike-sharing scene with AllTrails. Elliot Mitzelfeld, Kendra McNamee, and Keegan Alexander came up with a radical and successful idea. Not only would they create an analog series of trifold hiking guides for several of the favorite hikes at Kalu Yala, but they one step further to try to fulfill the “modern” part of the mission and vision of Kalu Yala. They created the hiking guides’ digital counterpoint...and shared it with the world via AllTrails. Through research, experimentation, and implementation of best practices in sustainable living, Kalu Yala aims to become the world’s most sustainable modern town. Sustainable towns need low carbon footprints, sustainable building techniques and materials, regenerative and climate-friendly agriculture, healthy active lifestyles, social connections, and a thriving local economy. Modern towns need power, internet, and technology. Kalu Yala is shooting for the sweet spot: developing a town that embraces modern needs while utilizing best practices for triple bottom line sustainability. While students of the Kalu Yala Institute have been finding, developing, and enjoying the hikes around Kalu Yala for years, few Panamanians and even fewer visitors to Panama are aware of the amazing hiking opportunities in the Tres Brazos valley, only an hour from Panama City. AllTrails is changing this through social sharing of some of the favorite hikes in this area. Currently, we have five of the local hikes mapped and shared on AllTrails, and people have been regularly showing up at Kalu Yala to do these hikes! Because of the new influx of hiking enthusiasts brought here via AllTrails, Tres Brazos Outfitters has initiated a new webpage to serve as a guide to visitors who found Kalu Yala on AllTrails. The earliest visitors remarked about how they had no idea that our blossoming town existed at the trailheads. They mentioned we should warn hikers that the road to Kalu Yala requires a 4x4 vehicle and that the hikes themselves traverse private property. They also bought t-shirts and meals and refilled water bottles. They wished they had arranged a guided hike prior to showing up, and they wished they knew about the option to stay overnight at Bodhi Hostel at Kalu Yala. We took this data and these suggestions to heart. Now, when you visit the AllTrails maps of Kalu Yala hikes, you are directed to Tres Brazos Outfitters’ new AllTrails Landing Webpage, which tells visitors all they need to know about visiting to hike. And maybe even ... The Hike to the Caribbean! Before we add more hikes for public sharing, we are testing our new AllTrails Landing Webpage to make sure that it gives visitors the proper information prior to their arrival at Kalu Yala. Tres Brazos Outfitters hopes that hikers will come prepared and that MORE hikers will come because of the information explained prior to their arrival! Come to Tres Brazos Valley for amazing hikes, and make sure to stop by Tres Brazos Outfitters in Kalu Yala Town Square! If you have any suggestions for improvements using the AllTrails platform at Kalu Yala, please email marie@kaluyala.com. To explore on the AllTrails app, search "Kalu Yala"